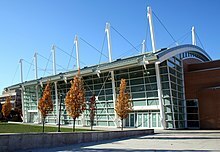 César Pelli's Ratner Athletic Center uses cables and masts as load-bearing devices. An engineer in the structural, mechanical, electrical, construction or other engineering fields of building design and construction. A licensed engineering professional in parts of the United States. Architectural engineers are those who work with other engineers and architects for the designing and construction of buildings. Structural engineering involves the analysis and design of the built environment (buildings, bridges, equipment supports, towers and walls). Those concentrating on buildings are sometimes informally referred to as "building engineers". Structural engineers require expertise in strength of materials, structural analysis, and in predicting structural load such as from weight of the building, occupants and contents, and extreme events such as wind, rain, ice, and seismic design of structures which is referred to as earthquake engineering. Architectural Engineers sometimes incorporate structural as one aspect of their designs; the structural discipline when practiced as a specialty works closely with architects and other engineering specialists. In many jurisdictions of the United States, the architectural engineer is a licensed engineering professional. Usually a graduate of an architectural engineering university program preparing students to perform whole-building design in competition with architect-engineer teams; or for practice in one of structural, mechanical or electrical fields of building design, but with an appreciation of integrated architectural requirements. Formal architectural engineering education, following the engineering model of earlier disciplines, developed in the late 19th century, and became widespread in the United States by the mid-20th century. With the establishment of a specific "architectural engineering" NCEES Professional Engineering registration examination in the 1990s, and first offering in April 2003, architectural engineering became recognized as a distinct engineering discipline in the United States. In most license-regulated jurisdictions, architectural engineers are not entitled to practice architecture unless they are also licensed as architects, and may be restricted from the practice of structural engineering on specific types of higher importance buildings such as hospitals. Regulations and customary practice vary widely by region or city. In some countries, the practice of architecture includes planning, designing and overseeing the building's construction, and architecture, as a profession providing architectural services, is referred to as "architectural engineering". In Japan, a "first-class architect" plays the dual role of architect and building engineer, although the services of a licensed "structural design first-class architect"(構造設計一級建築士) are required for buildings over a certain scale. In some languages, such as Korean and Arabic, "architect" is literally translated as "architectural engineer". In some countries, an "architectural engineer" (such as the ingegnere edile in Italy) is entitled to practice architecture and is often referred to as an architect. [not in citation given] These individuals are often also structural engineers. In other countries, such as Germany, Austria, Iran, and most of the Arab countries, architecture graduates receive an engineering degree (Dipl.-Ing. – Diplom-Ingenieur). In Spain, an "architect" has a technical university education and legal powers to carry out building structure and facility projects. In Brazil, architects and engineers used to share the same accreditation process (Conselho Federal de Engenheiros, Arquitetos e Agrônomos (CONFEA) – Federal Council of Engineering, Architecture and Agronomy). Now the Brazilian architects and urbanists have their own accreditation process (CAU – Architecture and Urbanism Council). Besides traditional architecture design training, Brazilian architecture courses also offer complementary training in engineering disciplines such as structural, electrical, hydraulic and mechanical engineering. After graduation, architects focus in architectural planning, yet they can be responsible to the whole building, when it concerns to small buildings (except in electric wiring, where the architect autonomy is limited to systems up to 30kVA, and it has to be done by an Electrical Engineer), applied to buildings, urban environment, built cultural heritage, landscape planning, interiorscape planning and regional planning. In Greece licensed architectural engineers are graduates from architecture faculties that belong to the Polytechnic University, obtaining an "Engineering Diploma". They graduate after 5 years of studies and are fully entitled architects once they become members of the Technical Chamber of Greece (TEE – Τεχνικό Επιμελητήριο Ελλάδος). The Technical Chamber of Greece has more than 100,000 members encompassing all the engineering disciplines as well as architecture. A prerequisite for being a member is to be licensed as a qualified engineer or architect and to be a graduate of an engineering and architecture schools of a Greek university, or of an equivalent school from abroad. The Technical Chamber of Greece is the authorized body to provide work licenses to engineers of all disciplines as well as architects, graduated in Greece or abroad. The license is awarded after examinations. The examinations take place three to four times a year. The Engineering Diploma equals a master's degree in ECTS units (300) according to the Bologna Accords. The architectural, structural, mechanical and electrical engineering branches each have well established educational requirements that are usually fulfilled by completion of a university program. It's multi-disciplinary engineering approach is what differentiates architectural engineering from architecture (the field of the architect): which is a integrated, separate and single, field of study when compared to other engineering disciplines. Through training in and appreciation of architecture, the field seeks integration of building systems within its overall building design. Architectural engineering includes the design of building systems including heating, ventilation and air conditioning (HVAC), plumbing, fire protection, electrical, lighting, architectural acoustics, and structural systems. In some university programs, students are required to concentrate on one of the systems; in others, they can receive a generalist architectural or building engineering degree. ^ "Building Services Engineers Bring Buildings to Life". Chartered Institute of Building Services Engineers. ^ "Licensure". NCEES. Archived from the original on 2012-11-01. Retrieved 2013-10-20. ^ "Architects / Building Engineers in Japan" (PDF). The Japan Architectural Education and Information Center. p. 5. Retrieved 2014-08-16. ^ "Role & Objectives". Technical Chamber of Greece. Archived from the original on 2011-08-14.